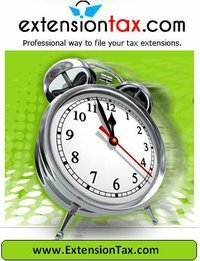 ExtensionTax.com: E-file an Extension Form 4868 and report your personal income taxes late!!! Personal Income Tax Extension Form 4868 is due on April 18th, 2011. Life is getting busier every day. Don’t wait until April 18th to file your taxes or tax extension. File an extension now and spend time to do your things through Oct 15th. Our system is now certified and approved by the IRS for accepting e-filing extension forms for the tax year 2010. ExtensionTax.com is a premier efile service provider in the Tax Industry and it is the professional way to efile any extension tax returns with IRS. Get easy 6-months tax extension to file your personnel income tax returns. Simple and Easy steps, complete an extension tax in 3 simple steps in minutes. Get instant “TEXT Alert” on status of your return. Receive an email confirmation once your extension is IRS Approved. No Penalty to Filing an Extension. Manage multiple businesses/personnel extension tax returns in one single Account. Do a Tax Extension from anywhere, anytime. 99% of Tax Extensions filed through us were accepted by IRS. Rated #1 by tax payers.